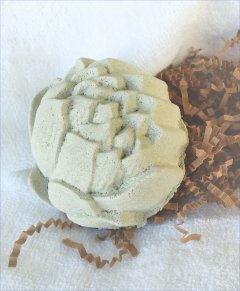 This All Natural Lotus Bath Bomb is the perfect way to pamper yourself in the tub with a cup of tea and calming tunes. 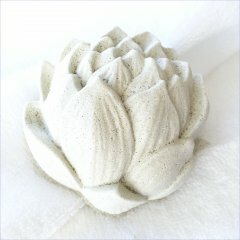 We formulated this green lotus to give you a stress relieving skin- softening soak. Ingredients: Citric Acid, Natrium Bicarbonate, French Green Clay, Witch hazel and Organic Essential Oils for aromatherapy. French Green clay offers important minerals and has enormous absorbent powers due to the constitution of its micro molecules. It literally “drinks” oils, toxic substances, and impurities from your skin. Its toning action stimulates the skin by bringing fresh blood to skin cells. The White Lotus we formulated for sensitive skin. Ingredients: Citric Acid, Natrium Bicarbonate, Kaolin Clay, Witch hazel and Organic Essential Oils for aromatherapy. White Kaolin clay, is a very fine and light clay that has natural absorbency properties. It is the mildest of all clays and is suitable for people with sensitive skin. It helps stimulate circulation to the skin while gently exfoliating and cleansing it. It does not draw oils from the skin, so it can also be used on dry skin types without negative results.